After a user quit, an administrator wanted to convert the mailbox to a shared mailbox, to free up the license the mailbox was using. Because the user handled important communications, he didn’t want to delete the mailbox right away. While I’d export the mailbox to a pst for backup, delete it and add the user’s address(es) to the mailbox of the person who took over the job, it is possible to convert a mailbox to a shared mailbox. Shared mailboxes in the Business and Exchange Online Plan 1 and Plan 2 have a quota of 50 GB. A license is not required for a shared mailbox provided you do not enable In-place Archive. If you are converting a user mailbox with an In-place archive to a shared mailbox, you'll need export the archive to a pst before converting the mailbox. Both on-prem Exchange and Office 365 Mailboxes can be converted to shared either using PowerShell or using the Exchange Admin Center. To convert mailboxes using the web interface, open the Office 365 Admin center in your browser. Select Users then select the mailbox you need to convert. It will take a few minutes to convert the mailbox to shared. 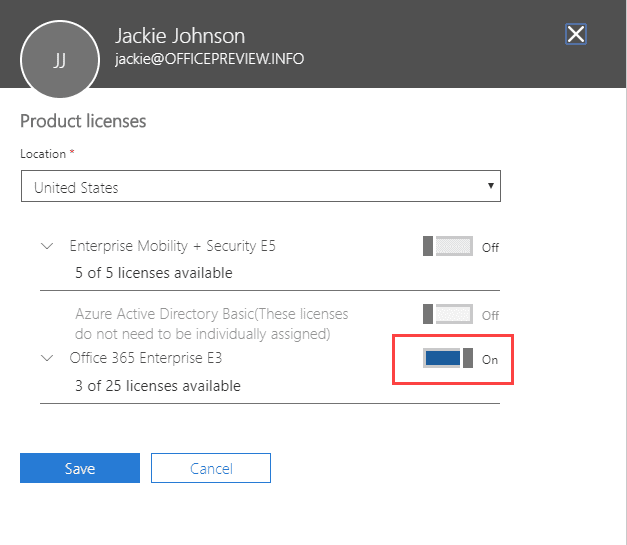 Once finished, remove the license from the mailbox in the Office 365 Admin center. Select the account again, then click Edit to the right of Product licenses. Slide the license indicator to Off then click Save. If you are comfortable using Powershell, you can use the Set-Mailbox cmdlet to convert a mailbox to a shared mailbox. If desired, you can change the quota before setting the mailbox to shared. The Type parameter supports Regular, Room, Equipment, and Shared as values. To create a list of all users and mailbox types to a csv file, use this cmdlet. Name returns the display name; you can use alias instead (or add alias as another field). After converting the mailbox, give other users Full Access and Send As permission as needed. 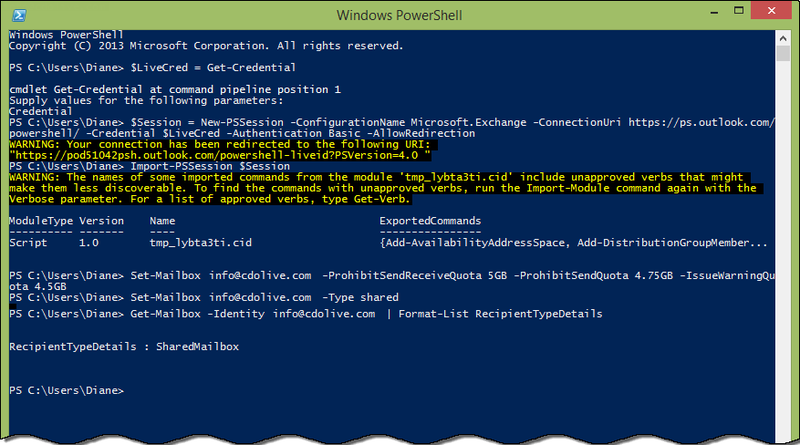 You can do this from the Exchange Control Panel or using PowerShell. Now you can remove the license from the account in Users and Groups. Two dialogs will warn you that removing the license will delete the mailbox and the contents, however, because you converted the mailbox to a shared mailbox before removing the license, the mailbox won't be deleted. Note: while the mailbox contents are safe, Lync contacts may be lost. Are you sure you want to remove the Exchange license? The user’s mailbox and all messages in it are deleted. We recommend that you only delete licenses from users who no longer need email. All email aliases associated with the user account are deleted. If you need someone in your company to receive email at those aliases, assign them to another user. Their Lync Contacts list may be deleted. To restore their Lync Contacts, assign the user an Exchange license within 30 days. If you want to remove their Exchange license but keep their Lync Contacts, contact Support before you remove the Exchange license. This is a known issue when using Microsoft Partner logins. What if I want to convert a "user" (=UPN without a license) not a usermailbox to a shared mailbox? This is a contact? I think you will need to remove the contact from the gal then add the address back as a shared mailbox. This powershell converts a mailbox to a user, but i didn't see one to convert a user to mailbox. i have Exchange 2013 cu17, i don't see that convert option in the ECP. I don't have an Exchange 2013 ECP handy to double check, but if they it's similar to the new Office 365 interface, it was moved to the main user admin screen (where you assign licenses and reset password). Select the user, expand the mail section - convert to shared is at the bottom. All, I have several mailboxes the need to be converted to shared mailboxes. First, I want to run a script that will verify the type of mailbox it is. I would like to import a CSV file and have the script tell me what each mailbox type it is. 2nd, I would then create another CSV file and import the contents into a 2nd script that would convert the mailboxes to a shared mailbox. How can I move an Exchange shared calendar to Office 365 as a shared calendar? You (or someone with the right permission) needs to create the caendar in office 365 then use a list view to select all, copy and paste to the new calendar. We've been converting user mailboxes to shared for at least 6 months now. The users with rights to the shared mailboxes are reporting that the shared mailboxes are no longer receiving new emails. Is there another setting in console that needs to be enabled for converted user to shared mailbox to receive email? 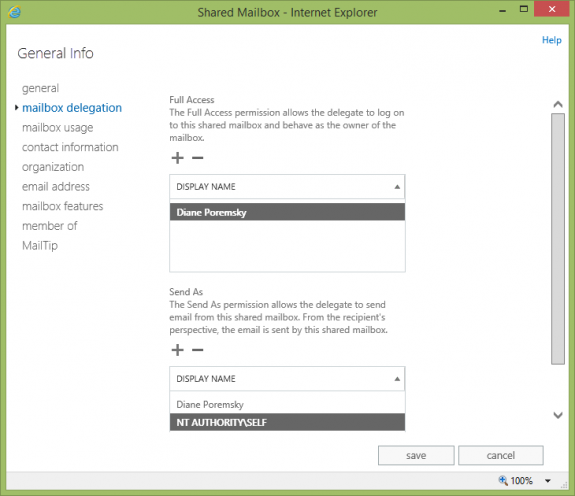 Can external users be members of shared mailboxes? How would they access the shared mailbox? 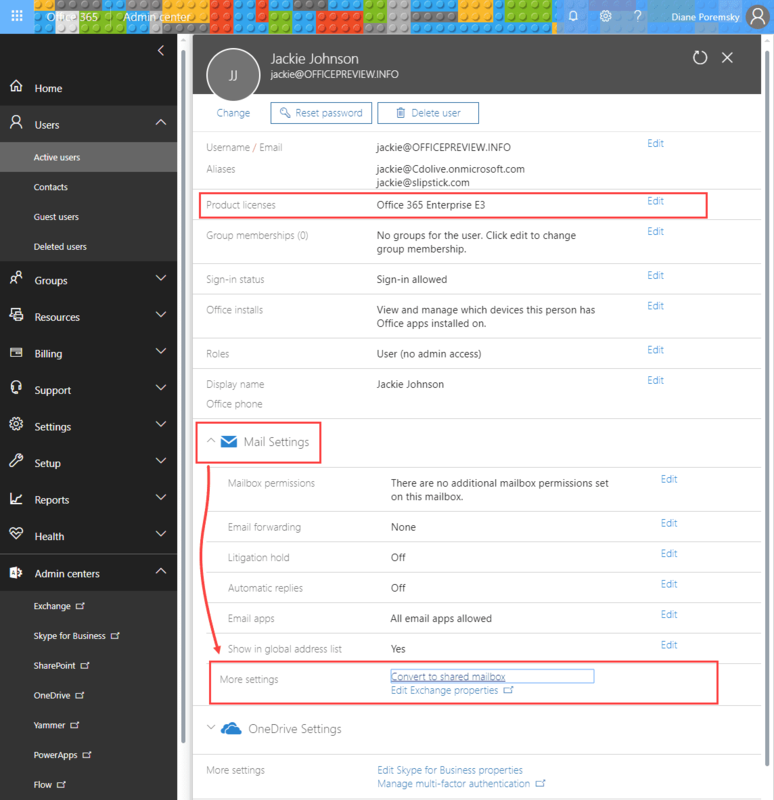 If you create a mail contact, they get a password and an internal address (but no mailbox) then assign their user contact full access permission to the mailbox, they can log into Outlook on the web using the internal address and password - address would be https://owa.domain.com/owa/sharedmailbox@domain.com/. It can take some time for the permissions to propagate. You can't use Outlook on the desktop, on the web interface. It can take about 15 minutes for permissions to update after adding the contact to the shared mailbox. Thank you for the article. Converting the mailbox is really simple. However, I cannot find the option to remove the license from the AD account. We have a local server, not online. Any ideas? Is everything on the local server or it is a hybrid configuration? Set-MsolUserLicense -UserPrincipalName alias -RemoveLicenses "company-name:ENTERPRISEPACK"